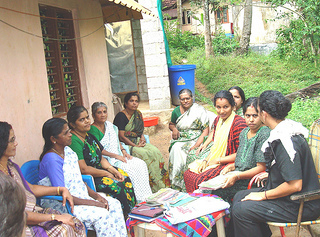 THIRUVANANTHAPURAM, India , May 19 2013 (IPS) - The disease itself may not discriminate on the basis of gender, but when it comes to healthcare for patients with diabetes, women in India find themselves at a disadvantage compared to men. This was the conclusion of the study, ‘Impact of Gender on Care of Type 2 Diabetes in Varkala, Kerala’, which analysed gender roles, norms and values in a household and found women patients to be more vulnerable. And this vulnerability influences all phases of diabetic care, according to the paper by Dr Mini P. Mani at the Achutha Menon Centre for Health Science Studies (AMCHSS) in Thiruvananthapuram, the capital of the southern Indian state of Kerala. Even when they themselves suffer from diabetes, women cannot abandon the ‘caretaker role’ in the family and have to continue to prioritise the health of other family members above their own, the study found. Further, inequitable access to resources prevents early diagnosis of the disease in women. Of particular concern to women and gynaecologists in the country is Gestational Diabetes Mellitus (GDM), a form of the disease that affects pregnant women. The incidence of GDM has grown fourfold in the last 10 years, according to Dr B. Rajkumar, a doctor of Indian Systems of Medicine at the Keezhariyoor Government Ayurveda Dispensary in the state’s northern coastal district of Kozhikode. “Earlier, pregnant women would engage in physical activity while doing housework. Today, the lifestyle of women has changed. Lack of exercise affects the body. And obesity, too, is a cause of gestational diabetes,” he said. One in five pregnant women in Ahmedabad in the western Indian state of Gujarat were found to be suffering from GDM, according to a study by the Diabetes Care Institute in that city, whose results were reported in February. And women with GDM were at higher risk of developing diabetes later in life, warned an earlier study in Kerala’s neighbouring state of Tamil Nadu, conducted by a group of doctors led by endocrinologist Dr V. Seshiah. “They are the ideal group to be targeted for lifestyle modification or pharmacologic intervention in order to delay or postpone the onset of overt diabetes. Hence, an important public health priority in the prevention of diabetes is to address maternal health both during the ante- and post-partum period,” the study noted. Medical researchers believe that the disease, earlier considered an ailment of the rich, is on the rise in India. Close to 70 million people – half of them women – in this country of 1.21 billion are living with diabetes, and the number is predicted to go up to 101.2 million by 2030. Nearly 60 per cent of diabetics in India have never been screened or diagnosed due to a lack of awareness, according to a 2012 report published by the Brussels-based International Diabetes Federation (IDF), an umbrella organisation of diabetes associations in 160 countries. The study also noted that nearly 63 per cent did not even know the complications that arise from the disease. Healthcare experts say that a combination of dietary pattern, sedentary lifestyle, obesity, and genetic predisposition puts Indians at a unique risk of acquiring diabetes. Analysing the increasing percentage of diabetic patients in the country, Dr Meenu Hariharan, director of the Indian Institute of Diabetes in Thiruvananthapuram, told IPS that Indians were more prone genetically to diabetes than Europeans. “Reduced physical activity and obesity accelerate the onset of diabetes in genetically predisposed people,” she said. Starch-rich diets and increased intake of tinned foods with a high content of preservatives are other culprits. A host of studies and screening programmes have highlighted the fact that diabetes is spreading fast across the country. Cases of diabetes are higher in the four southern states – Karnataka, Tamil Nadu, Andhra Pradesh and Kerala – than in other states, according to the results of a countrywide blood testing campaign conducted under the National Programme for Prevention and Control of Cancer, Diabetes, Cardiovascular Diseases and Strokes by the country’s health ministry. In Tamil Nadu, 11.76 per cent of people tested positive for diabetes, 10.2 percent in Karnataka, 8.83 per cent in Kerala, and 8.72 per cent in Andhra Pradesh, compared to just 2.95 percent in the central Indian state of Madhya Pradesh, which reported the lowest incidence of the disease. Alarmingly, rural areas are also seeing a rise in diabetes rates, as a fall-out of rapid urbanisation. However, the incidence of the disease remains higher in cities than in villages, according to Dr V. Ramankutty, a well-known health activist and professor at Thiruvananthapuram’s AMCHSS. Talking to IPS, he charted the rise in the incidence of the disease. A survey in the early 1970s, he said, found only 2.3 per cent of the urban population and 1.5 per cent of the rural population to be suffering from diabetes. But by 1992, the proportion had gone up to 8.2 per cent and 2.4 per cent for urban and rural areas, respectively. A repeat survey after five years found an even higher prevalence of the disease in urban areas, at 11.6 per cent. But if it’s any consolation, insulin-deficient diabetes in children is less common in India than in Western countries, said Dr G.D. Thapar, former director of the Ram Manohar Lohia Hospital in New Delhi. In his book ‘How to Lead a Healthy Life despite Diabetes’, he emphasised how crucial breast-feeding is to prevent the disease in children.